Many of us want to have people over, but honestly, it’s a bit of a hassle at times, right? By the time you clean your house, make a pretty table, cook for everyone, buy the flowers … add that to a weekend filled with activities and it can seem too daunting to even consider. But it doesn’t have to be. Make your food the day before and the gathering suddenly becomes just a little easier. Yes, make-ahead recipes are your golden ones for busy seasons. Invite friends for an afternoon lunch, maybe on a Sunday, and you can still get to bed on time to start your week fresh … with no hangover! Be inspired by the table setting and mood created by the talented team at 12th Table. StyleBlueprint also created five recipes that you can make ahead of time. See … you CAN do this! Today, we partnered with 12th Table, with offices in Jackson Hole, WY, and Nashville, TN. They plan parties ranging from large weddings and galas to smaller affairs, like intimate birthday dinners. 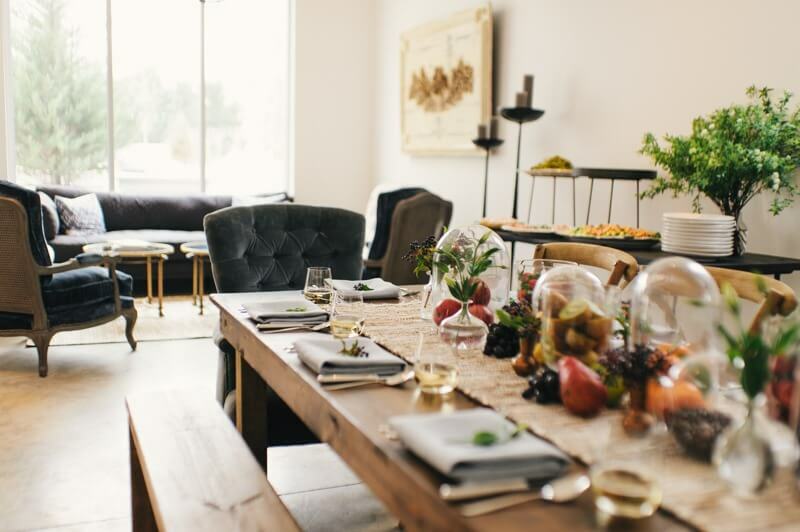 As they also rent supplies, including dishes and furniture, have a florist on staff and have gorgeous studio space, they were the perfect partner to create this dreamy table that you can emulate at home. We also created five make-ahead recipes which made for one delicious menu. For today’s weekend lunch celebration, we wanted to create a setting with a table that would call people to it and beg them to linger longer. We didn’t want it stuffy or formal, but we did want it to feel special. “Understated elegance,” as 12th Table likes to say. Consider hosting this outdoors in warmer weather — you CAN drag your indoor furniture to the grass for a gathering (or rent some)! — or make it cozy indoors if it’s too cold. But turn on the music, take time out of your chaotic schedule and give cheers to one of the most important things in our life: good friends and family. Find a table, clear it and set up a champagne bar. We gathered some of our favorite champagne selections from RED Spirit & Wines including: Ruffino (prosecco) and Veuve Clicquot orange label. Note the sprigs of lavender to add an easy extra touch to the champagne. Really, this party is one that you can make ahead, so that you can actually sit down with your guests and enjoy! The day of the party, put your time into creating a beautiful, but simple, table setting. Seen from above, the scene includes fresh fruit, coffee beans and a few flowers. The kiwi and lemons were cut in half to add to the decor. Here’s another view of the fresh fruit centerpiece. And, with some fruit under the domes, some in open containers and others simply on the table runner, the look is at once special, yet casual. We love the brass vases. A beautiful setting beckons you to the table. Fold your napkin into a large square and add an herb or small flower to the center. We were able to use all this furniture that 12th Table rents, including these upholstered pieces, and you can imagine how this scene would look outside, as well! Don’t be afraid to carry your furniture to the grass for the day! Everything here can be made the day before. And the food! Here is the marinated shrimp, roasted asparagus and spinach-walnut pesto pasta. The ham rolls and banana pudding pie are out of view. Ham biscuits with Dijon-chive butter can be made a day ahead, or even longer if you freeze them. Yes, you CAN freeze them! This spinach-walnut pesto with rotini pasta is absolutely amazing! Make extra of this marinated shrimp, as sneaky hands will grab some as it marinates! So go ahead, invite some friends over! Go all out by hiring a company to help you or do it yourself. But at the end of day, you need some eye-to-eye time with your besties, so make a date!